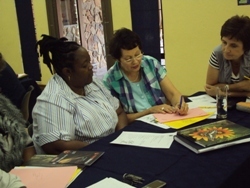 Capacity development comprises teacher professional development and training and forms part of the Human Capital Development Programme at the Garden. Teacher professional development focuses on supporting teachers and increasing their capacity. These teacher workshops are linked to the curriculum content. 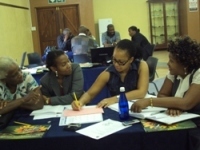 Themes covered are: biomes of South Africa, biodiversity, taxonomy and careers linked to biodiversity. 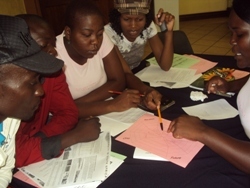 SANBI and the Department of Education work together in planning and organising these workshops. Workshops normally take place on weekday afternoons, but arrangements can be made for Saturdays. There are no costs involved for teachers, they only have to arrange for their own transport. Light catering is provided by SANBI should workshops run for the whole day. The centre runs environmental education training for school leavers who are interested in becoming Assistant Education Officers. These educators work in the Garden on an ad-hoc basis. Training is for one week. The trainee undergoes a test, which is followed by a series of tagging and co-facilitation of school groups before a candidate is declared competent and receives a certificate. Assistant Education Officers only work when school groups are booked. Contact Simphiwe Ngwenya for more information or to make a booking.